Just in time for a Labor Day BBQ or picnic with friends, Strawberry Shortcake! I picked up oodles of strawberries on the weekend and made this dessert and will be making jam this weekend too. I love strawberries, and use them throughout the year, but in summer they almost become a staple, same as eating tomatoes on a daily basis. I have made shortcakes from scratch on many occasions – this was not one of them. Instead I turned to Bisquick and honestly I have to say the texture and flavor is sooooo close to “scratch” that I tend to defer to Bisquick as it is so much quicker! Also, I prefer individual shortcakes as opposed to making one large shortcake, which is what I grew up with. Why? Cuz when I make the really large one for 8 or 10 people, it looks terrible after you cut the first slice. The individual ones look amazing from start to finish. 1. Using Bisquick make shortcakes per the recipe according directions on the box. 2. Whip the heavy cream till it starts to come together and add 1 Tbl granulated sugar and the vanilla extract. Whip till firm and set aside in the refrigerator. You will now have 3 cups of whipped cream. 3. In a double-boiler add the 2 yolks and 2 Tbl confectioners sugar – mix till smooth and fluffy. You can’t do it directly on the stove or you will have scrambled eggs within 30 seconds. It takes about 3 minutes to do this, but really worth it. When done, remove from double boiler and set aside – don’t refrigerate but you want it to cool down. 4. Rinse and hull strawberries and cut into halves and quarters depending on size of berry. Clean the raspberries at the same time. Note that I don’t sugar the strawberries. When you do, the berries start to break down and become soft within an hour and I feel there is enough sugar in the coulis and whip cream to compensate. 5. Make a Rich Simple Syrup: In high sided pan add 1/2 cup sugar with 1/2 cup cold water over medium high heat until the sugar is completely dissolved – this takes about 5 minutes. Do not let it bubble and boil or it will carmelize. 6. Using a food processor, add the raspberries and pulse till mushy. Now add the Simple Syrup and pulse till it’s pureed. Take this mixture and put it through a food mill, or mash through a fine mesh sieve till you get a satiny sauce. Pour into a plastic squeeze bottle (you can get these at any craft store – they cost about a dollar). 7. Take the whip cream and gently fold in the egg/sugar combo you made in the double boiler in Step #3. 8. Ready for plating – squeeze some Raspberry Coulis onto the plate – be creative with your squiggle, as there is no way to mess this up. 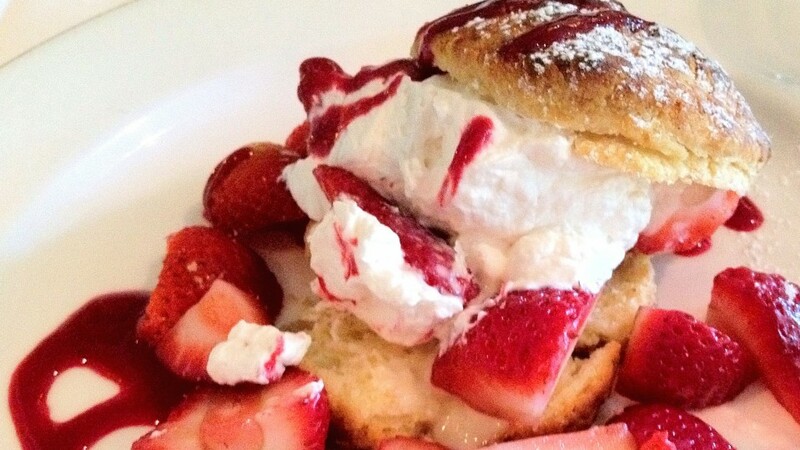 Add bottom of shortcake on top of the coulis – add generous spoonfuls of whipped cream. Now layer on your strawberries as you much as you want. Add the top shortcake and sprinkle with a little confectioners sugar on top. Then drizzle on a little more of the coulis on top of shortcake and whip cream. Eat! Nothing like being “up close and personal” with a few strawberries! This looks delicious for Labor Day weekend! Thanks for sharing! Thanks for visiting -just went to your blog and loved it! This looks scrumptious! The pictures are wonderful! Thanks Dimple for visting – heading on over to your blog now! I love strawberry shortcake and love the use of raspberry coulis with it. Sounds so delicious! Thanks Suzanne! The raspberry coulis brings another layer of flavors to the shortcake – really boosts it up a notch. Thanks Liz! Working on the jam today and will finish them all up on Sunday. Can’t have too much strawberry jam!